"Van Nuys is unique because it's the world's busiest general aviation airport. It controls more traffic, has more activity than any other general aviation airport in the world." This release has a dual distinction of being one of the first documentaries and one of the first independent releases in the HD-DVD format. It combines gorgeous photography of planes in flight with a brief history of southern California's Van Nuys airport, which attracts plenty of traffic. A "general aviation" airport, Van Nuys offers facilities for smaller jets and private planes, with a takeoff every 45 seconds. The historical aspects of the documentary are passed over almost too briefly. I would have liked to have heard more about the experimental aircraft, for instance, which frequent Van Nuys. A few segments stand out though, such as the Pregnant Guppy, which flew massive rocket parts from the factories in California to Florida, and the service of the airport during World War II. There's mention of Hollywood's extensive use of the airfield as a location, though it serves mostly as a teaser lacking in specificity. The combination of modern and vintage footage provides a more than attractive depiction of the airport and its long service, dotted with recollections of pilots young and old of their affections for it. The downside is that the film repeatedly preaches about the loss of general aviation airports, referring to them as an "irreplaceable resource." It's a case of what goes around comes around, since rail buffs have long had the same complaints about aviation interests agitating for equally irreplaceable railroad lines to be torn up, and it's just as annoying as listening to a rail buff complain about that situation. The picture was funded in part by Cessna, so the lobbying is understandable, but that doesn't make it any more palatable. Nevertheless, the cited example of the surreptitious midnight destruction of Chicago's Meigs Field doesn't seem quite right. That said, the real selling point, however, is the HD footage of all manner of planes in flight. Much of it is drop-dead gorgeous, with scenery and aircraft galore. Unfortunately, there's a distinct lack of pilot's-eye-view footage that would allow one to feel like you're in the cockpit, therefore distancing the viewer. But for those who like looking at planes in flight, you've got a bonanza here. And for the truly obsessive, at the end there's a handy list of each and every plane seen during the film. Image Transfer Review: The image quality is a little uneven. Some sequences are sharp and crisp, without any artifacting, and a few shots of planes have massive edge enhancement haloes slapped on. But the color is frequently stunning, with the yellow of planes and chrome just popping off the screen, and many sequences have a 3-D appearance that's as good as anything from the major studios. The MPEG2 encode shows some limitations, though, such as the shimmering on the fine design on Clay Lacy's sports coat. Audio Transfer Review: The disc features a DD+ 5.1 track that's very clear and clean, with excellent quality. That's particularly noticeable on Freddy Clarke's guitar solos, where the audio picks up the subtlest nuances of his fingers on the strings. Surround activity is pretty much limited to the score; there are no opportunities for serious bass but the music has solid enough range for what's required. Extras Review: While there is a long list of extras on the disc, the vast bulk of them consist of bits of airplane footage. Three of these are presented in HD, with the balance in standard definition presentations that suffer seriously from aliasing and chroma noise on the frequent reds. Among the HD featurettes, Into the Clouds (3m:37s) offers a montage of flight footage set to an Enya song. The Joyride III (1m:31s) offers acrobatic flying, with the camera in the cockpit but looking at the pilot instead of what the pilot sees. The final HD extra is a montage of the most gorgeous scenes from the feature (12m:39s), and it will make a great HD-DVD demo reel for the family. Five other featurettes are in SD, though the one of time-lapse photography of clouds just begs to be seen in HD. There are also two substantial galleries of historical photos and production photos. A set of three deleted scenes discuss the Lockheed plant and the mysterious U-2 spy plane, Reagan's use of the airport for Air Force One, and most amusingly, the tiny Ercoupe, a popular midget airplace sold in Sears catalogues. That's just another tantalizing glimpse at a subject that looks as if it could support a documentary of its own. 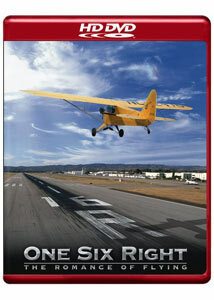 At times annoyingly preachy, One Six Right is a must for pilots and aviation buffs, and there are plenty of extravagant visuals for the rest of us to enjoy here as well.